Middle class professionals in the UK are drinking to problem levels, according to two separate reports, published last month. High earners in professional jobs, such as doctors, lawyers, and teachers, are much more likely to be regular alcohol drinkers than those on average incomes, according to NHS Digital and the Office for National Statistics. The surveys also found that how much people drink varies with age. A fifth of people surveyed said they did not drink at all. 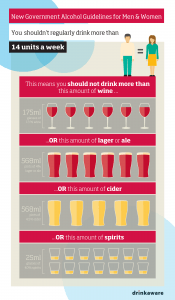 Data from previous years in the Health Survey for England showed the most harmful drinking was among middle-aged people, who were more likely to drink every day. “The over-45s particularly are drinking more regularly but not thinking they’re in danger”, says one addictions expert. Without financial consequences or impaired performance at work, many middle class professionals carry on drinking, ignoring the health warnings about increased risk of cancer, heart disease and liver disease. For women in particular, there is an 11% increase in chance of developing breast cancer even at so-called safe levels of alcohol consumption. Alcohol experts believe that there are several myths which support the rise in middle age, middle class problem drinking. One expert talks about the “myth of wine at home”. He claims that professionals who drink wine in the evening are persistently in denial about the damage their drinking habits do. Another myth, he believes, is what he calls the “functioning well at work myth”. Many professional people, who routinely endanger their health with alcohol, believe that if they still perform in their job, then their alcohol intake is not something to worry about. Data from the two reports shows that people earning more than £40,000 a year, are more likely to develop excessive alcohol habits. to keep health risks from alcohol to a low level, it is safest not to drink more than 14 units a week on a regular basis. The risk of developing a range of health problems, including cancers of the mouth, throat and breast, increases the more you drink on a regular basis. Consumption of alcohol at this level, carries a risk of long-term illness. Organs known to be damaged by long-term alcohol misuse include the brain and nervous system, heart, liver and pancreas. Heavy drinking can also increase your blood pressure and blood cholesterol levels, both of which are major risk factors for heart attacks and strokes. Regular drinking can affect the quality of sleep, making you tired and sluggish. This is because drinking disrupts your sleep cycle. When you drink alcohol before bed, you may fall into deep sleep quicker. This is why some people find drinking alcohol helps them drop off to sleep. However, as the night goes on, you spend less time in this deep sleep and more in the less restful rapid eye movement (REM) phase of sleep. Anxiety and depression are both made worse by alcohol. Alcohol is a depressant. It disrupts the delicate processes and chemicals of the brain, affecting our thoughts, feelings and actions and sometimes our long-term mental health. Regular drinking lowers the levels of serotonin in your brain – a chemical which helps regulate your mood.